There’s a good chance that your man, like most men, probably doesn’t spend too much time (or money) thinking about finding new footwear. This is where you come in. Sometimes guys need that little extra push to finally get rid of those beat-up basketball shoes and finally find something new. Sometimes, if you want something done right, you’ve got to do it yourself. Here are a few tips for women looking to outfit their man with something new on their feet. Chelsea Boots | No man should be without a good pair of boots, especially in the spring. There are still more than a couple cold days left and the April showers can quickly swamp up a nice pair of sneakers. This is where the boots come in, and it doesn’t have to be a pair of hiking or work boots either. There are plenty of versatile options when it comes to a sturdier pair of shoes and one of our favourites is the classic Chelsea boot. This laceless leather look exudes style and can be dressed up or down to be paired with a suit or a nice pair of jeans. It’s also hard to deny the variety of handsome styles available for this boot from traditional tan leathers to black suede, so you can always find the perfect pair to match any outfit. Additionally, with the elastic side-panel, your guy can still quickly slip these things on while heading out the door. 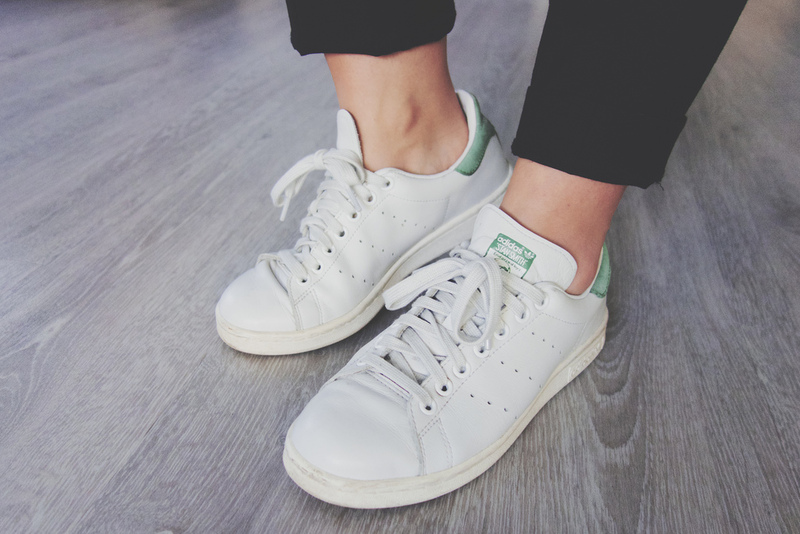 Stan Smith Tennis Shoes | We’re betting that your guy already has one or two pairs of sneakers in his closet. We’re also willing to bet that at least one, if not both, of those are a couple of years old and have probably seen better days. That’s why it’s up to you to help point him in the right direction. Last year, everyone was going crazy for the all-white Stan Smith shoes from Adidas. Even though white looks great, it can get dirty easily. Luckily, Adidas will be releasing even more tonal colourways for the Stan Smith this season including red, navy and gray. We highly recommend trying to get your hands on a pair of these. Chances are your guy will thank you for being so fashion forward and thoughtful by getting him something that’s not only cool and comfortable, but practical as well. Oxford Dress Shoes | If your guy doesn’t already have a pair of dress shoes then this is something that needs to be fixed—quickly. A pair of Oxfords is an essential must for absolutely any man and have been named as one of the only three kinds of shoes a man needs. The Oxford is the classic dress shoe that always looks good and never goes out of style. They’re a great way to elevate any casual ensemble and put the perfect finishing touch to any formal wear.